Considered by many to be the birthplace of coffee, Yirgacheffe is known for its fruity flavor and sweet aroma. Notes of peach, honey and lemongrass provide an excellent base to compliment the light floral scent of this bean. 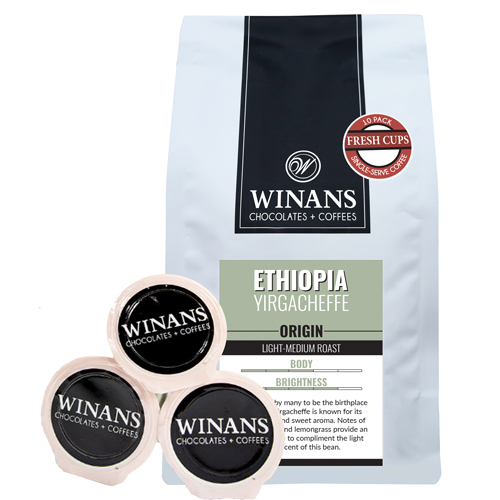 Presenting Winans Fresh Cups! These single-serve coffee containers both reduce the time needed to brew coffee and simplify the brewing process. They also help to keep the unused coffee fresh by individually packaging portions so they are not unnecessarily exposed to air and light. Compatible with most single-serve brewing systems.